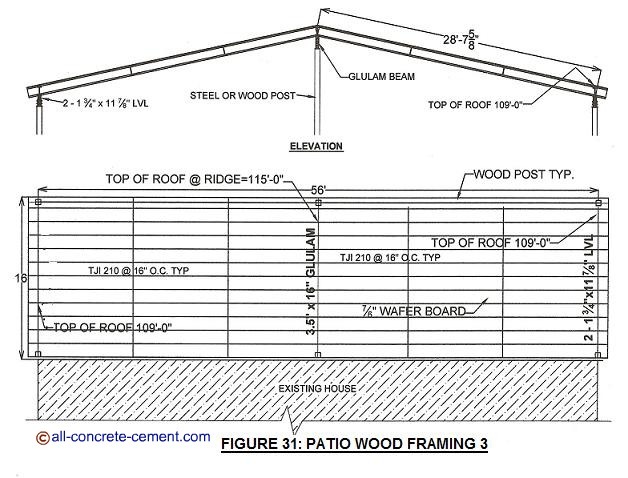 Figure 31 below is an alternate wood patio cover design to figure 28 and figure 30. Wooden patio cover such as these are patio cover ideas that can either be build as shown in the sketches or use as guide on how the framing should be done. The framing in these different designs had been sized based on 15 pounds per square foot dead load and 20 psf live load. Depending on local building requirements these can easily be verified by a local licensed engineer prior to proceeding with construction. The design in figure 31 uses TJI roof joists that spans over 28 feet. The support points required are at 3 locations identified in figure 31 with the beam call out. One at the ridge a glulam beam 3.5”x16” deep. The two beams at the opposite ends are double LVLs 1 ¾”x11 7/8” nailed together. If wide flange beam is easier or less expensive than glulam, W12x14 will work or you can use the procedure for steel beam design to select a different size beam. There are two line of blocking left and right sides of the ridge beam. These are intended to use TJI joist and chop them to fit the 16 inch spacing specified. On top of the TJI roof joists will be 7/16" wafer board of which the roofing will be attached to. This design can be raised higher than an RV if the intend for the patio cover is to house an RV. Below the patio cover will be a patio slab or driveway that can be of gravel, concrete, asphalt or whatever type is desired. Below each steel post or wood post, there must be concrete footing with concrete pier extending the concrete high above the ground. Footing size 2 ft x 2 ft x 10 inches thick should be sufficient for this patio cover. With all these 3 different wood design patio covers figures 28, 30, and 31 they provide great choices as to what type to use. From cost stand point these 3 designs can be taken for material suppliers and contractors for reliable estimates.